Because we are in Southern California, we’re able to be outside most of the year. We do a lot of entertaining and much of it is on our patio. 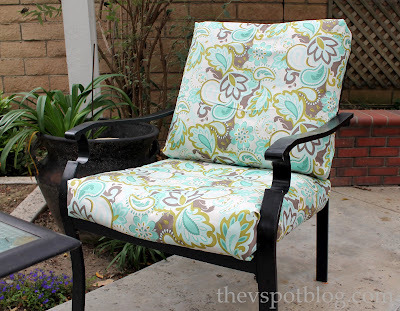 It’s nice to change up the look of our patio furniture, and we can do so pretty regularly with just a little fabric and a glue gun… I love a good no-sew project! Riley Blake Designs has some amazing fabrics and I knew this fun paisley inspired print was just the thing to bring a shot of color to my patio. We recover our cushions regularly because they were looking a bit worn, but are still perfectly comfortable. 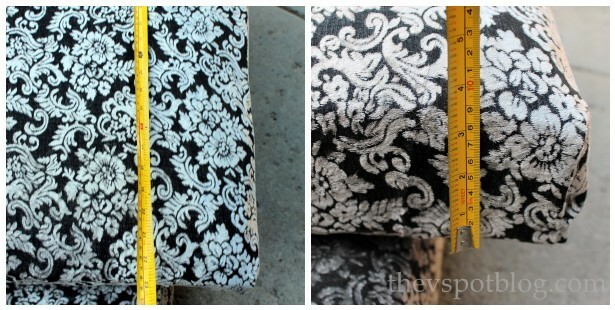 Because we use a glue gun we can change the fabric as often as we like. The last fabric we had on our cushions was a black and white combo for a Halloween Party. Start by measuring the widest part of the cushion and the sides. The width of the cushion was 25″ and the sides were about 3″ high. 25+3+3 = 31″ then I add another 6″ to ensure it will wrap around to the back. I cut a total length of 37 inches. The next step is to pull the old fabric off of the cushion. The fabric always pulls off and the old glue sticks to the cushion. This allows me to toss the fabric into the washing machine and save it for future projects. I love that I am able to use these materials over and over again. Take the cushion and center it on the new fabric. See? The old hot glue sticks to the cushion, not the fabric so you can reuse the fabric over again. This is just like wrapping a present, but instead of paper it’s fabric and instead of tape, you’re using hot glue. Just like a present… fold up the sides and glue. Then fold the “ends” and secure them as well. The fact that this “seam” is present doesn’t matter on most furniture. No one sees the bottom of the seat cushion, and most chairs have a back support that hides the seam on the back cushion. Is it going to last forever? No… but then again, I don’t want it to. I love being able to change up my patio, depending on the event. These chairs are perfect for the Mother’s Day Brunch we host each year. Colorful cushions and a Mother’s Day Mimosa… Nice! So remember: It’s OK to recover old cushions. It’s OK to use a glue gun to do it. It’s your patio… do what you want! what is the texture of type of fabric used? This is my kind of project! They look fabulous! If only that would work here! This is wonderful, Vivienne! I use hot glue a LOT, but I haven’t tried it for something like this. I think I was afraid that it wouldn’t hold up. But you’re right: it doesn’t have to last forever. Thank you for giving me courage to try this. And your new fabric is gorgeous, by the way! OMGSH! See… there ya go again! Inspiring me to not BUY replacement cushions, but simply cover the one’s I’ve got! 😉 heehee They’re great! THANK YOU for giving me permission to do this 🙂 Our cushions are 5 years old at this point & needing a re-fresh. I’ve thought about sewing new covers or having some made, but wow they’re expensive! Think I’m going to need a bigger glue gun though, my little mini one won’t cut it for this…. Can you believe May is over already?? Nothing that some glue gun can’t fix! Turned out great! I can’t wait to try this! I bought 2 good but brown rockers at the thrift store and an ottoman at a yard sale. I painted them all bright red and put black/white cushions in the rockers. My problem: the cushion that was in the ottoman was the wrong color but perfect condition. I have spent more time searching online for a coordinating cushion than I had spent painting! Now, I can’t wait to get to the fabric store!!!! I believe you just saved me a lot of time and money!! That’s so great! I hope this helps you out! Wow! Thank you so much for this DIY projest, just love your idea. Don’t sew to well so this is great. You have saved me (I think). I have 6 (no, 12 counting the backs) nasty, torn, recently decorated with paint by my 6 year old, cushions for a perfectly good patio table that stay outside year round (I too, live in So Cal). Here’s the problem…I have never done an arts or crafts project and my wrapping is so bad, one year everyone thought it was “super awesome” that I let my then 3 year old wrap all the gifts herself. (naturally I replied “yes, didn’t she do a wonderful job?!”). Normally my husband does all the wrapping. I desperately want to be the mom who can whip up a bunch of fabulous party favors out of some rope, and construction paper and left over buttons, but at 45, the only thing I’ve been able to do is crochet one incredibly long string. I have a glue gun…not sure where it is…never used it. However, this time I swore it would be different. We just can’t afford the outrageously priced cushions for sale, so I scoured the internet about making my own cushions. Then I came across yours and it hit me, duh…the filling is still in good shape, all I need is fabric and a glue gun! I used to run multi-million dollar business, surely I can do this, right?! So, I guess my question is, would it be wise to use some quilt banting (see, I don’t even know the right word but I think you know what I mean) to keep the fabric from slipping? Also, what is the best “type” of fabric to use (sunbrella?). I am very intimidated by Joann fabrics, even though my mother worked there (on East Coast) for eons because, of course, she is a master seamstress, making all our clothes growing up (it was the 70s so it was ok then), my sister’s wedding gown, quilts and curtains to die for and the most exquisite baby clothes you could imagine. If she didn’t live 3000 miles away, trust me, I’d hire her. She always said it was the tragedy of her life that NONE of her 3 girls picked up her gift for this. I’m not allowed to have a sewing machine after the last “incident” (let’s just say my idea to hem the curtains didn’t turn out too well). I’m hoping I won’t have a repeat using a hot glue gun, but I will have paramedics standing my just in case. Wish me luck! And thank you for making it seem like even I could do this! OMG, I just saw your comment about Erma Bombeck…I LOVE her! I was recently in Cambria for a little r & r and The Olalliberry Inn. While browsing an antique shop I came across 2 of my favorite books by her “If life is a bowl of Cherries then why am I the pits?” and “Just wait until you have children of your own”. I had to buy them! Melissa, your comment made my day. You can totally do this! The word you were looking for is “batting” and no, I don’t think you need to use it. Seriously, just pretend that the fabric is wrapping paper and that the cushion is a gift, and you will be fine. Don’t be intimidated at the fabric store. 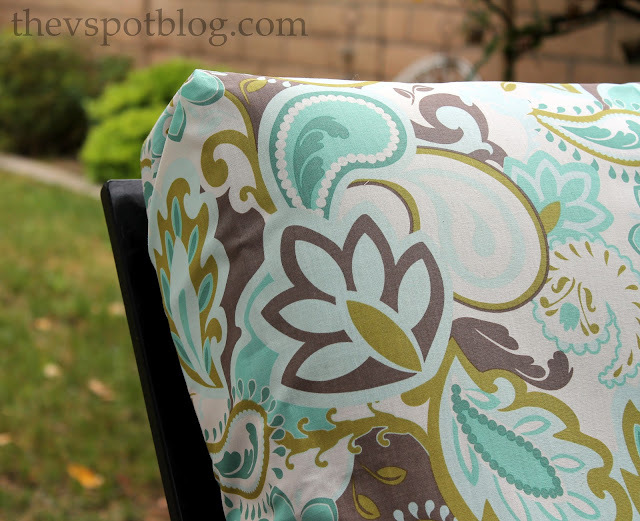 Part of what is so great about this project is you can get inexpensive fabric and give it a try… change it up a lot or a little. I’d recommend giving it a try for the summer with something fun and summery (don’t worry about heavy duty, expensive outdoor fabric) Just get the hang of it first. Going to give this a try. One question though, won’t the glue remelt in the hot sun as my patio furniture is on my back deck and gets a lot of sun (thus my black fadded year old cushions)? Hi Karen, I have never had a problem with the glue melting in the sun. Thanks for reading! I am definitely going to try this. I have been at my wits end about recovering/replacing my cushions. They are so expensive and my cushions are awesome. The covers are faded and when I washed one it fell apart. Has anyone else out there done this? I have ordered swatches of different fabrics and am going to try one! TThanks for this idea! I am having the same issue, I have cushions for our chairs that are sectioned into 3 pieces they cover the seat and back,.I plan to try making a large “pillow case” type cover that I can remove and launder. Nothing fancy, just one big “sack” that is snug fitting enough to look neat. I just ordered fabric samples that is $8.95/yd. We have 6 cushions so it will be expensive, still much less than new cushions. What is the best way to figure out how much total fabric you will need? I am ordering it online and want to be sure I have it right! I have 2 deep seated chairs, and a sofa that has a solid bottom cushion and two back cushions. Hi Kirsten, I am not sure what to tell you. Make sure you order enough so that the length of the fabric is double the longest side of the cushion, allow for the height of the cushion, and then include a little extra if you can. I am so not a measure type person when it comes to this. Because I eyeball it so much. Good luck! Need help! Have perfectly good patio furniture, the frames that is. But the original cushiony covering is part of the chair and disintegrating. However the backing is indestructible nylon that has not worn thru all the winters in Iowa we ve home through. I want to recover the surface of the chairs. Any suggestions would be greatly appreciated! I love love this idea. I also love the fabric ! Do you know the name of it and where I can find some? Thanks for posting this it’s great! It’s Riley Blake fabric. I don’t remember the name of the print itself, but the link to their website is in the post. Love this idea, just what I was looking for!! I may give this a try with shower curtains (fabric not plastic). They’re inexpensive and you can find them in so many color options. what glue gun are you using? thanks! I’ve done this and I don’t even use glue. I wrap like a present and then hold them with upholstery pins. Very easy and they come apart easily when I want to replace them. for less than what I would’ve spent on new cushions. I’ve been wanting to do an outdoor living room for 2 years but didn’t want to spend $500-1000 so I just didn’t really do anything until I could find a good enough deal. But that deal never came and we are having a lot of company over and wanted to do something!!! I found a pretty rug and with the coordinating outdoor fabric I have a deck I’m proud of!!! My only regret is I wish I would have got more fabric. I got 6 yards for 4 L shaped chairs and really should’ve gotten 7 or 8 to give a little extra “wrapping” for the back. Oh well! Next time 😉 thanks again for sharing this awesome idea! Love the encouragement that this is “your house and you can use a glue gun on your chairs!” I keep repeating that to myself! Haha! Blessings to you! You have officially made my day! Thank you, Ginger! LOVIN’ this idea! I can’t wait to do this on my tired cushions and change my sunroom with the seasons. Yay!! Fabric comes in varied widths. Wonder which width fabric you used? Thanks for this idea!! Do you know how long the glue holds up outside before i’d have to redo? How did the fabric glue work? You saved the day! Great idea! ThanKs for being brilliant. So easy and i have everything i need to get started and i will after i say thank you again for this marvelous concept. Just completed cushion #1, looks marvelous and took no time. Off to complete second one. Thank you for this!!!!! exactly what kind of post i was looking for! i was thinking about buying shower curtains and cutting half?! what do you think??? This is awesome! Going to head to JoAnns for fabric but thinking of using velcro instead of glue, this new England weather is crazy and my Past history with hot glue is RATHER COMPLICATED..lol..thanks again!! I have seat and back Cushions that are pieced together, any suggestions for this TyPe of cushion? Also, i wS looking at vinyl fabrics, have you ever used vinyl? Fabulous! It’s so inexpensive and easy! Love how easy this is!! What r ur thoughts on shower curtain vs fanric, and velcro vs glue? I think glue is easier than velcro, and I think a fabric shower curtain would be great. Do you remember, How many yards of fabric you purchased? I do not remember, but it would be based on the size of your cushions, which are likely a different size from mine. Great idea, Vivien, As I can’t fiNd cushions that Have the same density. And firmness as my old cushionS had. I saved the foam from my 4 chair cushions and also the two from my outdoor loveseat and will try This tricK to recover each cushion. I will be so glad to get my thicker seat cushions back on my furniture as the new cushions are. Not made like the older, thicker foam ones were and not as comfy. I will probably try the glue gun first and of they don’t hold I’ll try velcro tape. This was a great idea! I bought the fabric i used for $32.00 instead of the $300 I was looking at to just replace my cushions with ones I really didn’t like. It took a little time to do, but i was working on eight cushions and making sure every part was glued. I can’t wait to make some for the fall! Thanks so much and I look forward to reading your other blogs to get ideas! Wondering was ghat water proof faBric. Great idea!!!! yES! OUR RENTAL PROPERTY WICKER FURNITURE HAS VERY OLD FABRIC AND THE SIZES ARE ODD SO WE CANNOT BUY REPLACEMENT CUSHIONS! THE COST TO PROFESSIONALLY REUPHOLSTER THE CUSHIONS IS MORE THAN A NEW SET OF FURNITURE! i AM A TERRIBLE SEWER AND AM ALWAYS TRYING NO SEW PROJECTS – i’M GOING TO TRY THIS!! i HOPE IT CAN HOLD UP TO A BUNCH OF RENTERS – YOU KNOW THEY DON’T “RESPECT” YOUR STUFF. tHINK i’LL THROW A FEW STITCHES IN SOMEHOW JUST FOR GOOD MEASURE. yOU’RE RIGHT, IT’S YOUR PATIO, DO WHAT YOU WANT! That sounds like an interesting idea! Do you think i can have se velcro strips? need to be covered comple.Tely. If i measure the cIrcumference of the widest part will this give me enough fabric to cover them completely? I have a double round outdoor chaise lounge. The covering is shot and needs to be replaced. I did look at replacement cushions but they cost as much as the entire chaise cost me!! Is there an easy way to recover this??? Do you treat the fabric with anything to keep it from getting mold and mildew since it’s not an outdoor fabric? I do not treat the fabric, as I’m in Southern California and we rarely have issues with mold or mildew. I’m sure it wouldn’t hurt to do so if you have issues. THIS IS THE COOLEST IDEA EVER.. I HAVEN’T BEEN ABLE TO FIND ANY NEW PILLOWS FOR MY OUTDOOR FURNITURE… AND MY SON IS GETTING MARRIED SO I WANTED TO CLEAN UP THE PILLOWS… ONLY QUESTION IS? WILL THE MEASUREMENTS COVER THE FULL BACK.? Margo, Do not base your measurements on my cushions…. base them on your cushions. I think that is one of the most significant info for me. And i’m glad studying your article. I’m so EXCITEd that I found your blog. This is a fantastic idea, using the glue gun and the velcro.. I Simply cannot afford new cushions For my 3 PERSON swing chair But I Spend So much On my porch and patio. I’ll take the a cushion to a fabric shop and let them tell me how much fabric I need. Thank you so much! I have one pIece cushions that have Tucks in them. Have you ever done one piece cushions ? 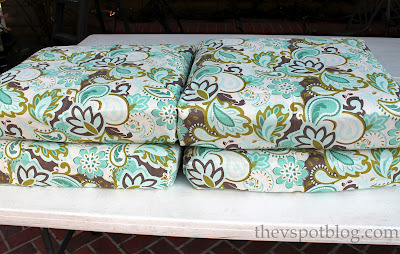 Have you tried this on cushions that are not square(wider in the front than the back)? This is such a brilliant idea (not sure why the message is typing in capitals!). I just wondered how I know what width of fabric to buy – do not want a gap at the back which i guess would happen if the fabric was too narrow..
Has this discussion closed as I would really like a reply to my question of may 6 2018 – dying to make these! I want to recover the surface of the chairs. Any suggestions would be greatly appreciated! As soon as i read the Dodgeball quote, i knew i was going to love this artIcle.